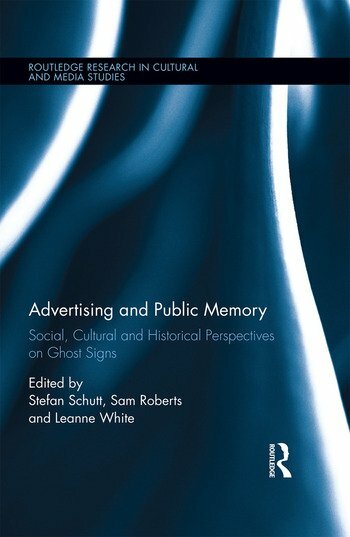 This is the first scholarly collection to examine the social and cultural aspects on the worldwide interest in the faded remains of advertising signage (popularly known as ‘ghost signs’). Contributors to this volume examine the complex relationships between the signs and those who commissioned them, painted them, viewed them and view them today. Topics covered include cultural memory, urban change, modernity and belonging, local history and place-making, the crowd-sourced use of online mobile and social media to document and share digital artefacts, ‘retro’ design and the resurgence in interest in the handmade. The book is international and interdisciplinary, combining academic analysis and critical input from practitioners and researchers in areas such as cultural studies, destination marketing, heritage advertising, design, social history and commercial archaeology. 2. What is a Ghost Sign? Stefan Schutt is an Honorary Fellow and former Research Program Leader at the Centre for Cultural Diversity and Wellbeing, Victoria University, Melbourne, Australia. Stefan's research interests revolve around the everyday uses of digital technologies. He is particularly interested in the intersection of technology, narrative and identity. Stefan is the founder of a number of award-winning community technology projects. He is also a ghost sign aficionado, and the creator of the Lewis & Skinner online signwriting document archive: www.lewisandskinner.com. Sam Roberts is Director of Ghostsigns and Better Letters, and Associate Researcher at the Typographic Hub, within the Birmingham Institute of Art and Design, UK. In addition to numerous published articles on ghost signs, Sam authored and published Hand-Painted Signs of Kratie about street signs in Cambodia. He curated the History of Advertising Trust Ghostsigns Archive, and leads the Ghostsigns Walking Tours in London. Leanne White is a Senior Lecturer in the College of Business at Victoria University in Melbourne, Australia. Her research interests include: national identity, commercial nationalism, popular culture, advertising, destination marketing, events and cultural tourism. She is the author of 50 book chapters and refereed journal articles, and co-editor of the Routledge research books: Wine and Identity: Branding, Heritage, Terroir (2014), Dark Tourism and Place Identity: Managing and Interpreting Dark Places (2013), and Tourism and National Identities: An International Perspective (2011).